to seek and to save the lost. (Luke 19:10) Joseph Parnell said, “There is no other news like this. Every other religion says it backwards. Every other religion tells us to seek.” Well in Psalms 14:2-3 David said, “No one seeks God.” Mainly because our best efforts fall far short of the righteousness required by God (Romans 3:23). So what do we seek? Wet typically seek fulfillment. We seek pleasure. We seek escape from pain. 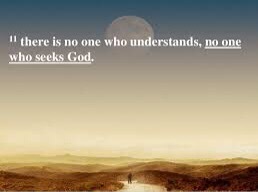 But the pure motivation of seeking after God for Himself is a gift from God. Scripture does say to seek Him with all our whole heart. However, we must understand that He has taken the first step toward us. So our seeking is merely a response to God’s calling.